On February 5th, I received my new laptop, a Dell XPS 15 9550. 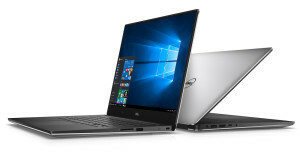 Before this laptop, I used to use a Dell Precision M3800, which has been replaced by the Dell Precision 15 5000 series, but the “only” difference between the two is the dedicated video card you can choose. The Precision sports a Quadro video card, whereas the XPS uses a GeForce card. Without going in too much details, this means that the Precision is better in professional work, such as AutoCAD, and the XPS is better at running games. Since one of my goals with this laptop was to get rid of my desktop PC, which I only use for games, the XPS was the more logical choice. As can be derived from previous posts, I mainly use Linux, more specifically Fedora, on my laptop. This is because I run a number of VM’s (via VirtualBox and Vagrant) and/or Docker containers at the same time. In itself, this is also possible on Windows, but on Linux the overhead is a lot lower than on Windows. I will not go into the details of how to use aforementioned tools, that is something for a different post. What I will go into in this post, as the title might suggest, is how to get Fedora 23 running on the XPS 15, how to dual-boot it with Windows, issues I have run into, and their solutions (hopefully). Also, be sure to read the end (last two paragraphs) of the post, which contain an important note :). I hope this post will help people who want to use Fedora on their XPS, and maybe I will even get a few tips and pointers in return :).